One of my favorite Christmas gift ideas is Snowman Soup! 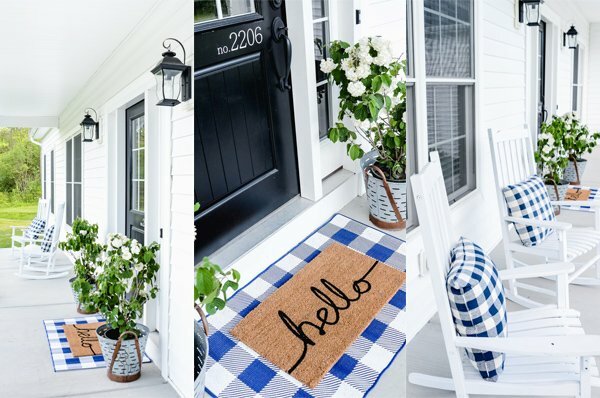 It’s so darling, easy to put together, and perfect for neighbors, teachers, friends, co-workers, and more! What is snowman soup you ask? Ingredients include a packet of hot chocolate, two mini candy canes, and a little bag of mini marshmallows, and when you put them all together, it makes the most adorable gift idea. I love it because it’s super easy to put together for one person, or a whole group of people. There are so many ways to put them together! I’ve used a mason jar or a cute mini paper sack to hold individual gifts, and for families, I’ll put all the ingredients in a paper lunch sack or clear treat bag. Add the super cute tag around the top, and you’re set to go! For the mason jar, I piled the marshmallows on the bottom of the jar, then layered in the candy canes and hot chocolate packet. When I’m putting together a package for a group of people (or when I use paper sack), I like to bundle the marshmallows together in a plastic snack bag with the zipper/top cut off, and tied closed with baker’s twine or ribbon. I like doing these for neighbor gifts, and if I’m packaging it for a whole family, then I use brown paper lunch sacks. I fill it with as many packets as there are people in their family, add the candy canes and small bags of marshmallows. Those bags fit a lot! You can do the same thing to close it–use a clothespin, ribbon, etc. I’ve also used cardboard takeout boxes, which are always super cute, but they won’t hold more than 2-3 servings. They also look cute in large mason jars! 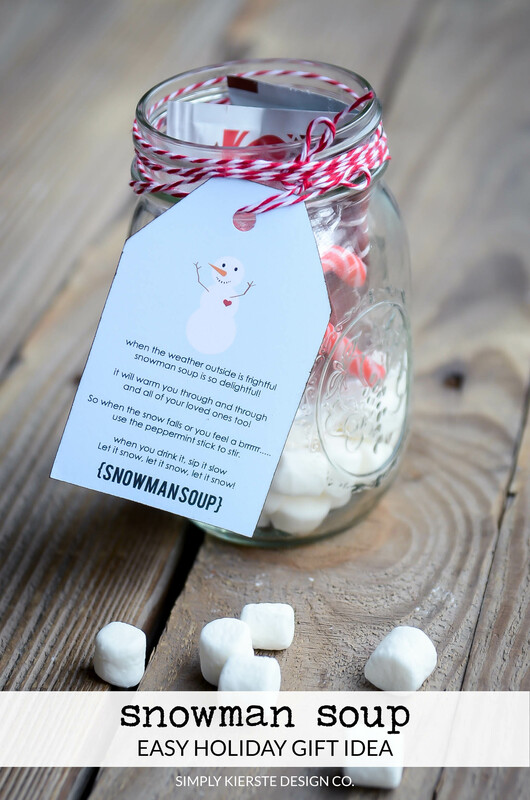 And it’s your lucky day…I’m sharing not one, but two different versions of the fun snowman soup tag! OPTION 2: I created two different sizes of printable–one about 3 3/4 inches, the other is larger at 5 inches. To download the tags, click on the link, and save the pdf file to your computer. Print on cardstock (white or cream)! This is such a fun new way to give hot chocolate! I have some tweens on my list this would be great for! thank you…. Yes! It would be SO fun for tweens!!! Merry Christmas!! What a cute idea. This makes me want to make one for all of my friends. Thanks for the free print outs, adorable! Thank you! I’m using this for my husband’s athletic workers. Love this! Thanks for sharing your nice idea. Thank you so much, Sally!!! I worked hard on that poem, lol, so I’m glad you like it. :) Merry Christmas!!! I made these! Thank you! I love this idea. I plan on making these for my Granddaughters 2nd grade class for Christmas. I made reindeer food for her class last year. I know this will be a big hit. I will also make some for our dirty Santa exchange. So fun. Are your tags available to download for commercial use? No, they’re not–and I appreciate you letting me know about this!! Thank you! Thank you for such a great idea! The Lables are darling! So adorable! Thank you for sharing! I love all the printable a that you are so sweet to share with us. May I ask what programs do you yes to create yours? I thought you mentioned PicMonkey at one time. I’m still such a design novice! I love this poem – I am using these for a public school party and some of the poems I found were a little too “Christmassy”. This one is perfect! Quick question – the hot chocolate mix I bought says to add milk only. Is there a way I can change the word water to milk in the poem? Thank you!! Hi there, is there anyway you can send me the file in layers? I wanted to see if I could change the colors in photoshop to match my twins birthday color theme. Was thinking it would be cute for favors for their snow tubing party. I just adore it! She is doing a blue and red theme for the party. Thanks! Unfortunately, I don’t have it. I usually make my stuff in Photoshop, but this one I didn’t. :( So sorry!!! Precious! I know some little ones who will love this. Thanks for sharing this. I love your pdf. Thank you for sharing for the “not so creative” type of people – like me! Question, when using card stock for these types of label what lb would you recommend? 65 or 110? Thanks again! Can I please have the printable that add milk instead of water? Thanks! I don’t have that printable, I’m sorry! If I have some extra time, maybe I’ll get to it! I had fun making these this year. Everyone loved them! Happy New Year to you. I love the poem and the gift idea. Thank you very much! Thank you for sharing! This is such a fun/cute gift idea!